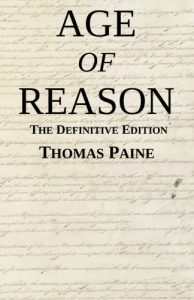 Age of Reason - The Definitive Edition - Michigan Legal Publishing Ltd.
Age of Reason, The Definitive Edition, includes Paine’s original two volumes of Age of Reason, plus his third volume which remained unreleased until 1807. President Thomas Jefferson convinced Paine not to publish his third volume in 1802, as Paine originally intended, out of fear of the backlash it may cause. Now, thanks to this edition of Paine’s Age of Reason, the modern reader can enjoy Paine’s three-volume original work in one distinguished manuscript.